On the program for tonight, 3 numbers with 2 rehearsals and a main performance in front of a crowded audience! Shine on the circus ring and receive the most applause in order to win the game! During the preparation of a circus act, players add new acrobats and accessories to their circus. Starting with the first player and proceeding in a clockwise direction, players must perform following two actions in the order of their choosing : take any one Component tile and tahe one 1st Act tile. 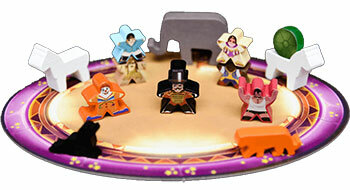 The players then retrieves the components corresponding to their tiles from the reserve and place them next to their circus ring. Note: The term "component" used here in the rules and on certain game tiles refers to any accessories, Acrobat or Guest Star. During the presentation of the circus act, the players assemble their components in order to answer as much of the public demands as possible by using the expertise of their acrobats. 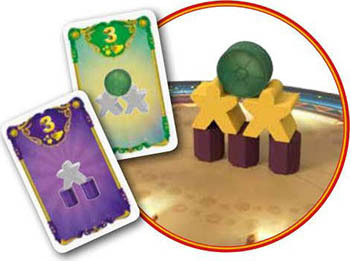 Before beginning the presentation of their circus act, players must have all their components outside of their circus ring and have no right to manipulate them. 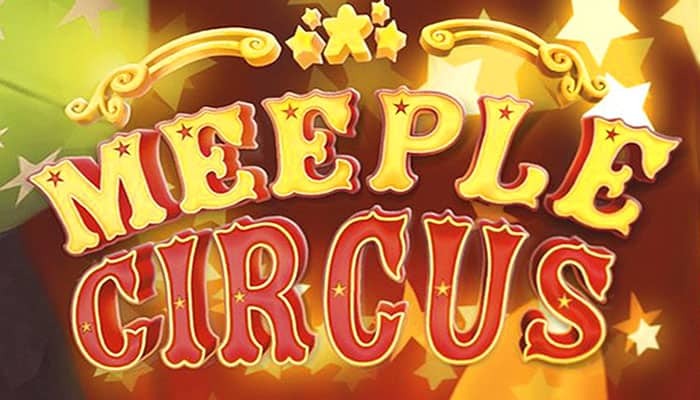 When all players are ready, the first player starts the music via the Meeple Circus application (or from the Matagot website). When the music begins, all players will construct their circus act at the same time. All components must be placed inside your circus ring. All components must be placed on their side except for beams and barrels. All components on the ground must carry at least one other component. Components that do not follow ALL of these rules will not be counted in the evaluation of the circus act. The first and second players who end their circus act (before the music ends) take the Speed Token and the Speed Token , respectively. If a player has not finished by the end of the music, he must immediately stop adding to his circus act. When evaluating the circus act, players win applause based on different criteria. 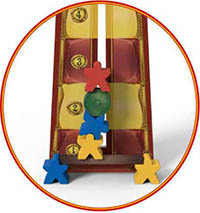 When a player wins applause, he advances his score marker as many spaces on the clap-o-meter board. The player scores as much applause as indicated on each of the Public demands cards whose conditions are fulfilled. It is possible to make the same card several times if at least one of the elements is different. The same component can count for different public demands cards. The figures must be taken in the direction indicated by the card. The meeples illustrated in gray can be Acrobat meeples of any color or Guest Star meeples of the same form (the Extreme horse rider, Tarzan, the Elephant trainer or the tightrope artist). In her circus act, Madison made 2 of the 4 Public demands cards. She met the first demand once and met the second demand twice for a total of 3 + 3 + 3 = 9 applause! Beginners Each blue acrobat touching the ground brings you 1 applause. Intermediates Each yellow acrobat that does NOT touch the ground brings you 1 applause. Experts Every red acrobat that carries no element brings you as much applause as its height in the circus act. To do this, use the measuring ruler, the highest zone touched by the acrobat tells you how many applause you win. Thanks to this magnificent pyramid, Matthew scores 1 applause for his beginner meeple, 1 applause for his intermediate meeple and 3 applause with his expert meeple. Each player in possession of a speed token adds the number of applause indicated. Each player keeps all his acquired components and places them next to his circus ring. The player with the smallest score (in the case of a tie: the youngest) becomes the first player and takes the token The new first player discards a Public demands card of his choice from the game and then returns the next Public demands card of the corresponding pick. The first player puts the remaining tiles and number 1 tiles in the box. Then he draws 6 new Component tiles and as many 2 nd Act tiles as the number of player plus one. Finally, the first player returns the First scoring tile back to the box, to show the first act has passed. When preparing, players now use the 2nd Act tiles. Important: When a player retrieves the items corresponding to his Guest Star tile, he only retrieves the corresponding Guest Star, the other components present on the tile are used to indicate the conditions in which his Guest Star will bring him applause. During the evaluation, the players will also add applause won from Guest Star. Each Guest Star will win applause if it is used in the right way. The first player now places the remaining Component tiles and 2nd Act tiles back in the box. He returns the second Scoring tile back to the box, and draws 6 new Component tiles along with as many 3 rd Act tiles as the number of players plus one. When preparing, players use the 3rd Act tiles. The great performance is enacted player after player. Starting with the player with the least applause score and then continuing in a clockwise direction. After the evaluation of the 3rd Act is completed, the game ends. The player with the most applause is the winner! In the case of a tie, the victory is shared.